His was a dream few spaceman ever saw come true. Alan Kemp was an obsessed man - driven by the realization of a dream into the black emptiness between the stars. In a rebuilt, second-hand, obsolete space ship, Kemp and his three comrades took off - determined to set up a shuttle service between the planets at the rim of the galaxy. But trouble - in the form of two lost colonies, one inhabited by giant mechanical insects and the other by the descendants of a murderous pirate - threatened. Kemp's crew began to wonder: just how much will one man sacrifice to realize a dream? A. Bertram Chandler (1912 – 1984) was an British/Australian science fiction author. He was born in England. Chandler was a merchant marine officer. In 1956, he emigrated to Australia and became an Australian citizen. He is most well known for his around 20 John Grimes science fiction adventure novels and his Rim World series. He published over 40 science fiction novels and over 200 works of short fiction. This is another book from my stack of vintage Ace Double books. 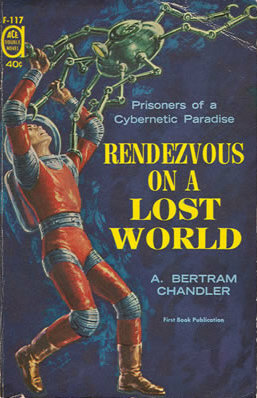 I decided to feature Rendezvous on a Lost World because it has, in my opinion, a striking science fiction cover, a spaceman confronting a smaller, spider-like robot. Is this one of the "giant mechanical insects" mentioned in the blurb? My copy of this book is in very good condition. As the last book, the pages have yellowed and the print font is small. The cover graphic was copied from A. Bertram Chandler's website, which contains good information about the author. I haven't read this science fiction book, so I can't say more. Perhaps something from my bookshelf to add to my to-be-read list? MONARCH OF MONSTERS -- OR MONSTER OF MONARCHY? Planet Fourteen -- just a speck on a spacial stereo map, just a world inhabited by a group of barbaric refugees. But to Belfeor, it was instant cash. All he needed was an iron hand and a means to dig out its radioactive resources for export to his own world. To Maddalena it was a final exam; this would be her last chance to prove herself worthy of Corps Galactica membership. To Saikmar, it was a nation and a people stolen from him by cruel treachery. To Gus Langenschmidt, it was part of a job he had, watching the skies and helping men who were being enslaved. But how do you help people who don't know you exist and who must not be told? 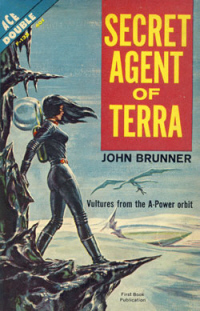 John Brunner (1934 – 1995) was a British science fiction author. His book Stand on Zanzibar (1968) won the 1969 Hugo Award for best novel. Other notable books include The Shockwave Rider (1975), The Sheep Look Up (1972) and The Jagged Orbit (1969). I randomly pulled Secret Agent of Terra from a stack of vintage Ace Double books. The shown book cover graphic is from Wikipedia, unfortunately my copy is a bit more worn. The pages have yellowed in the over 55 years since it was published. It's not many pages long but the print font is small. I haven't read this science fiction book, so I can't say more. Although digging out "radioactive resources", as mentioned in the description, sounds dangerous. I'm featuring this book because I thought the cover was interestingly retro looking. Perhaps something from my bookshelf to add to my to-be-read list?